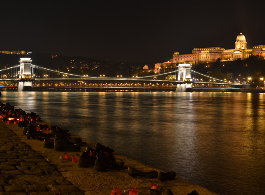 Route Planners for Budapest: there are several online route planners that may be of good use to you when planning your visit to, from and within the city of Budapest. 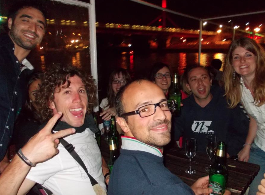 Whether you are looking for the best routes by car, by bus, tram or metro, on foot or by bike, you can find a good planner and even combine them to get the best out of your online route planning. 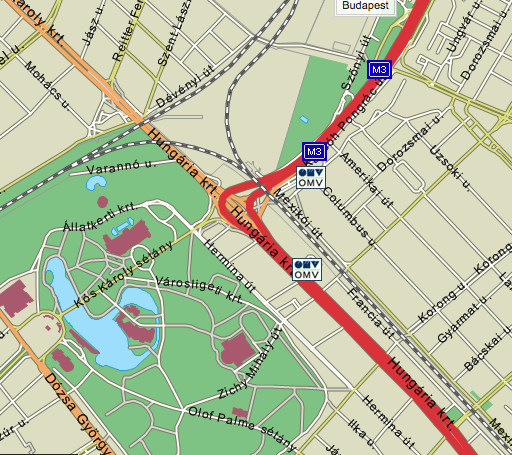 One of the Budapest route planners is the Budapest Route Planner software offered by the Public Transit company of Budapest – obviously used for public transport trips. 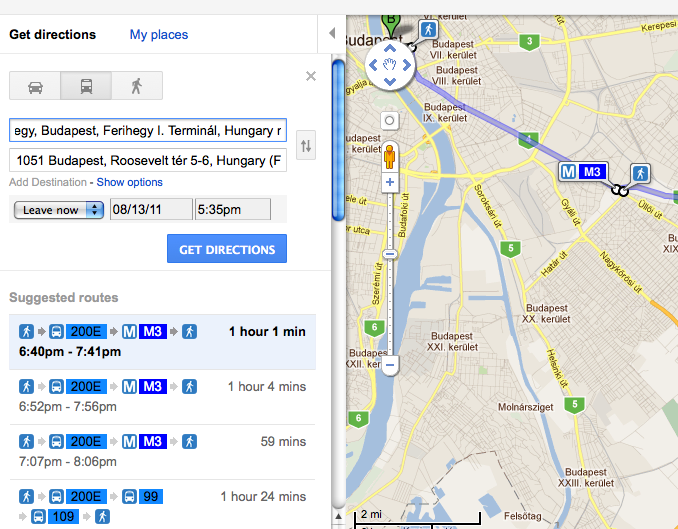 The other one is Google Maps Budapest route planner (for cars and public transport use). Then there is a Budapest route planner made by Utvonalterv.hu for cars, public transport and bikes, and finally the global route planner, Navtech Map24 with all kinds of fancy advanced search options and very professional route planning for cars. There are some other route planners, but we think that these are the most important ones currently. 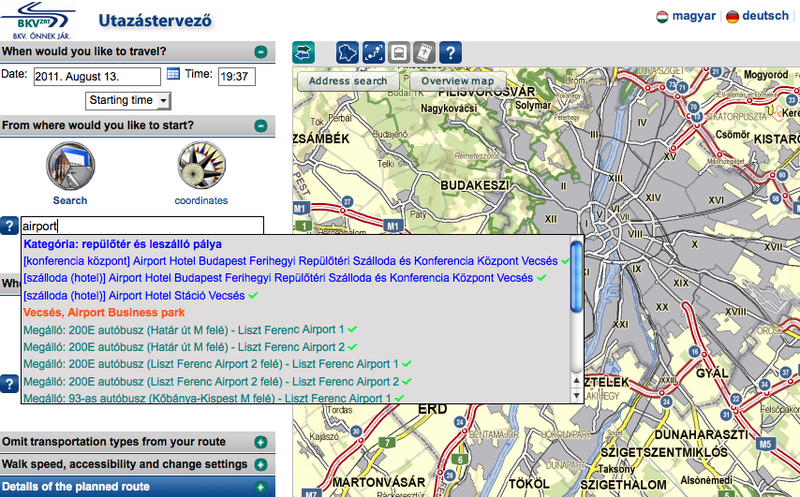 BKV (the company solely responsible for Budapest Public Transport) has a BKV online route planner. The main menu is in English but the options are often in Hungarian, which is not really tourist-compatible to say the least. Besides, some of the suggested routes may not be so optimal when you have lots of luggage to carry – based on our user tests. So the idea is good, the planner is functional, give it a try. 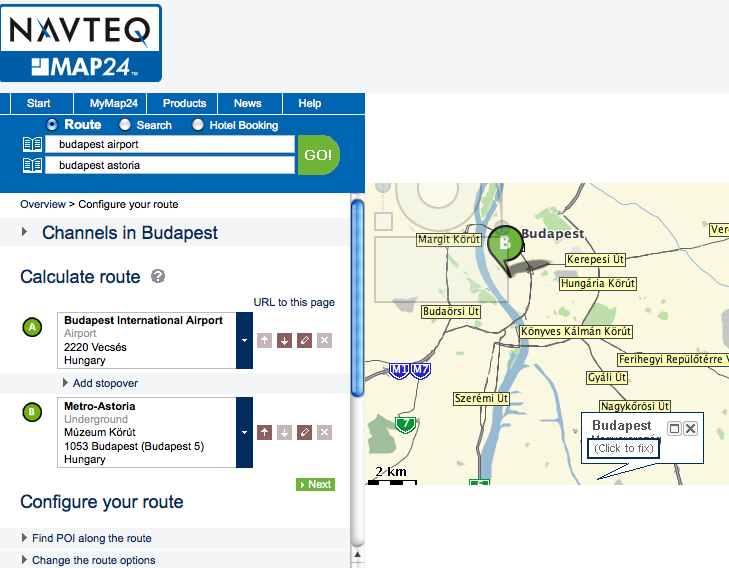 Here’s a screenshot which shows that the word ‘airport’ triggers far too many options for Budapest tourists, so the route planner has not been optimised for tourists at the moment. Budapest route planner of Google Maps – at least the FROM and TO parts are clearly seen on the map, and are recognized in English better than in the official route planner of the Budapest Public Transport Company – at least, that’s what we have found in our unofficial and non-representative user tests. Similarly to the route planner of Budapest Public Transport company, Google Maps Budapest route planner shows the BKV vehicles you can take, the length of the trip, other alternatives, where you need to walk and how long. All you need to click on the usual Google map is: point A where you start your trip, the Directions button, then point B where you want to go to. Then click on the ‘public transit’ icon in the upper left hand corner (the default direction and estimated time is shown for cars). The icon shows a little bus. Navtech Map24 for Budapest route planning is very professional as one can expect from a company specializing in route planning. It is warmly recommended for walkers or bikers too if you are interested in what points of interest are along your way, e.g. Budapest restaurants, Budapest hotels (you can search and book hotels right there), Budapest tourist attractions, petrol stations, and more. You can switch into 3d route flight conveniently. Please help us keep updated and informative. If there are any changes in the above, or you have any remarks, complaints, compliments regarding Budapest route planning, please send your comment in below.